It can take weeks or months after infection before antibodies against certain viruses (such as HIV, HCV and others) are produced and can be detected. 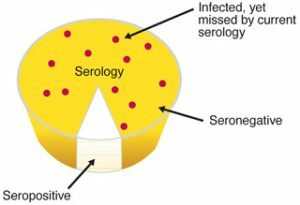 The time between infection and detection is called the “window period”. If an HIV/HCV antibody test is carried out during the «window period», the results will be negative since antibodies are not yet present at detectable levels. However, during the «window period» the infected person is able to transmit HIV/HCV to others. The length of the «window period» may vary from person to person, from community to community, and from country to country. The vast majority of people will develop detectable antibodies level within the first 3 months (6 months in HCV) following the time of their infection. In some cases, it can take as long as 6 months or more to develop antibodies to HIV and as long as 12 months to develop antibodies to HCV. It is impossible to contain the epidemic, since antibody negative people may be carrying the HIV virus and thus are able to infect others. On average, each unknowing HIV carrier can infect 50 and more people each year!. People who feel they may be infected, but had negative result in initial testing should confirm the results to ensure there was no false result 3 months later. Between tests, people live in fear of the unknown. People tend not to repeat the test and thus may contribute to the spread of the disease. HIV-positive mothers, in utero, during childbirth or by breastfeeding since the mother, if in the Window Period, will not get the preventative treatment. Anti-retroviral treatment (ART) provided to infected women during pregnancy reduces mother-to-child transmission of HIV from 25-30% to 1-2%. The opportunity to control the epidemic lies in detecting the infection in its early stages and focusing prevention and treatment on them.